If you haven’t read my previous posts I really suggest you do so as this post will continue where the previous one left off. Universe U: The collection of all elements we consider for our scenario. What exactly is algebra? It’s about the study of symbols, or operations, and laws for manipulating these operations. Elementary algebra, for example, is a set of laws for operations (+, -, /, *) on numbers. Just like that and are operations on sets and the laws used to manipulating them is called the algebra of sets. These laws can help us to simplify formulas. So let’s get started. Consider the following addition: 2 + 3. I’m pretty sure we all know the answer is 5 and the answer doesn’t change if we switch the numbers to 3 + 2. More abstract we can say that for every two numbers x and y goes that . When the order of operands (that is the objects on which an operation is performed) in an operation doesn’t matter for the outcome of that operation we call that operation commutative. Multiplication (on real numbers) is commutative too, because (you may be used to seeing x or * as multiplication symbol, but you should remember from high school). Minus isn’t commutative, because and neither is division, . When working with sets we can say that and . That means both and are commutative. When the order in which the same operation is performed in a single formula is unimportant for the outcome of that formula we say that the operation is associative. For example . It doesn’t matter if we first evaluate 1 + 2 and then add 3 or first evaluate 2 + 3 and add it to 1, the outcome is always 6. The same holds true for multiplication, because but not for subtraction, and division, . When looking at sets we find that both and are associative, because and . That means parenthesis can be omitted, removing any confusion on operator precedence. And when we combine intersection and union we can simplify as well. can be simplified to . Notice that we still need parenthesis to define the order of the and operations. And inline this look like and . Sometimes we don’t know if a set has 100 sets. Especially when a set is an infinite set of sets the above notation is not feasible. 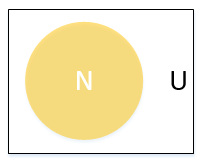 We can now use index notation to intersect or union all sets within the set. and basically means “intersect/union for every set i in set I” (think of a foreach loop on a List of Lists in C#). The distributive property is difficult to describe in words. Just remember that multiplication is distributive over addition, meaning that . More generally (the multiplication symbol is often omitted between letters). We can now show that . When we apply the distributive property on we get . (A n B) n (A u B) = ((A n B) n A) u ((A n B) n B). Unfortunately we’re not done yet. There are a few more properties, some of which we’ve already encountered, that I’d like to go over. First we have the absorption law, which states that and . We’ve seen the so called null element, or empty set, . Just like with numbers ( , and ) there are some rules for working with . Luckily they’re not that hard. I’ve shown you that a double complement returns the original: . Finally we’ll look at the law of De Morgan, named after its inventor, the British mathematician Augustus De Morgan. Suppose my blog can only be read by people who have not studied maths or IT. Let and let . So now the people who may read my blog are people who haven’t studied maths or IT: . I could also say people who haven’t studied maths and people who haven’t studied IT may read my blog: . But that’s the same set of people! In the following Venn diagram this is represented by the white part. Now suppose my blog may be read only by people who haven’t studied both maths and IT. So that’s . Or we could say people who haven’t studied maths and who haven’t studied IT, . And again this is the same set of people. 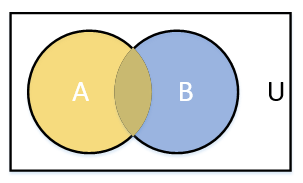 In the Venn diagram it’s the part where A and B don’t overlap (so almost everything). And so that means . Now let’s take another example of how to simplify a formula. Suppose we have . So let’s first apply De Morgan’s law: . And now you may recognize a nice pattern for distributivity! So let’s apply distributivity, . That’s nice, because we know that . And now we know that . And maybe you’ll remember this from my previous post, this is . And there you have it! And there you go! You algebra master, you! So how will this help you in your day to day programming tasks? For most of us very little I’m afraid, except that you can work out some difficult set operations on paper and possibly simplify requirements. I’m no database developer, but I can imagine you’d need this when developing databases (and to a lesser extent when working with databases). We did venture into the world of algebra though, and if you’re still with me I say congratulations! Algebra is a bit too abstract and difficult for many people. I’m leaving you with a little cheat sheet of today’s lessons and I hope to see you again next time (no algebra, I promise)! Hey everyone, welcome back to part two of the Maths in IT series. I got a lot of positive response, so I guess I should just keep doing what I was already doing. This post will continue where part one left off, so if you haven’t read it I suggest you do so now before continuing. As promised we’ll use this post to combine sets. Before we do that let’s take a look at how to visually represent collection. We can do this using a Venn diagram. A Venn diagram is about as simple as it gets (although they can be pretty complex too). Each set is represented by a circle. 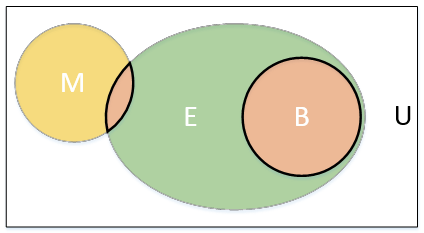 The diagram can illustrate relationships between the represented sets. Let’s look at an example. We have two collections, and . Let’s show them in a Venn diagram. When two sets have no shared elements, or for every goes that , we say the sets are disjoint. Now suppose (A is a subset of B). We can show this in a Venn diagram and you’ll recognize it immediately. 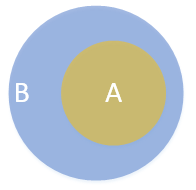 When A is a subset of B then B overlaps A completely. 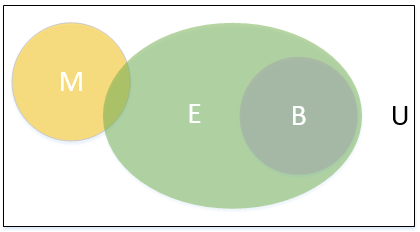 In the next sections we’ll combine sets and use Venn diagrams to visualize what elements we’re interested in. So suppose we have two collections, and . 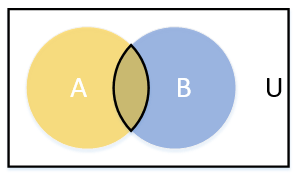 If I asked you which elements are in both A and B you’d answer c and d.
This is called the intersection of A and B. We can write this as . More formally we say that . 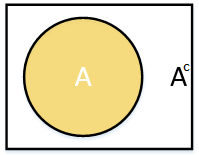 And here is the Venn diagram, which visualizes this nicely. The intersection is the part in the thick black line where A and B overlap. With an intersection we can give a formal definition of disjoint sets. When then A and B are disjoint. Furthermore we can say that for any collection A goes that . And when then (check the subset Venn diagram). The intersection of two sets is the set of elements x where x is in A and B. Likewise, the union of two sets is the set of elements that are in set A or B. So when we have and then the union of A and B is (no doubles). We can write a union of A and B as . In a Venn diagram the union is basically just both sets (the part in the thick black line). Unlike an intersection, a union of disjoint sets is not an empty set (notice that both sets have a thick black line). Now for any collection A goes that . Also when then (check the subset Venn diagram). When we’re talking about sets we’re usually not talking about that set in isolation. When I tell you that non-smokers live longer you understand that they live longer compared to people that do smoke. And you also understand that non-smokers and smokers combined make up for the worlds population. In this case we’re saying that we have a set of non-smokers in a universe of all people. We denote a universe with the capital letter U. For every set goes that . That makes sense as U represents all elements we wish to consider for our case. No collection can ever contain an element that is not a part of all elements. In a Venn diagram we draw a universe as a rectangle in which all our sets are drawn. In the following example N is the set of non-smokers and U is the universe containing all people. Now with the notion of a universe we can say we want all elements that are not in any collection A. We call this the complement of A and we write it as . In the following Venn diagram the white part represents . It goes without saying, but and . A little less obvious is that . It makes sense though, as we first take everything that isn’t A (the complement of A) and then we take everything that isn’t in the resulting set, but that is A. Try drawing it in a Venn diagram and you’ll see what I mean. A complement relative to a universe is called an absolute complement. A complement can also be relative to other sets. For example, when no universe is defined and we have sets A and B then the relative complement of A in B is the set of elements of B that are not in A. This takes the form of or . Giving the following Venn diagram we can already draw some conclusions. We can see that all birds lay eggs. Some mammals lay eggs too. No animal is both a bird and a mammal. As you see Venn diagrams can be really useful. Now suppose we want the set of all mammals that lay eggs and also all birds. This is the collection . That is, we take the intersection of M and E and union the result with B. In a Venn diagram we can see this collection (the red colored parts). Now we can get every combination of sets using intersection, union and complement. It’s not always easy, but it’s possible. As promised I’m going to keep things practical. So what’s the practical use of all this? Well, most languages let you work with exactly these functions! For example, take a look at this SQL expression. What will that return? It returns only 3 because 3 is an element of both collections. This example also shows the UNION operator. Basically this is the set . And SQL knows complement too. What happens here is that we have (an implied) universe and EXCEPT is the complement. So this query is basically the formula . We could also say that U is not defined and this is the relative complement of in : . But what about C#? In my previous post we’ve seen HashSet<T>, but I’m not going to use that now. Instead I’m just going with a List<T> as LINQ provides various extension methods for working with sets. Notice that HashSet<T> has its own methods in addition to the LINQ methods. You may wonder what that looks like in Haskell (since I’ve shown you Haskell the last time too), but it’s not really that different. I’ve actually needed this stuff in my day to day work. It’s not that hard and sometimes it’s an explicit business requirement. For example I needed all sales orders from The Netherlands, Belgium and Luxembourg (the BeNeLux). That’s really just a union! And I’ve needed intersect too, give me all Dutch customers that are not in some list of customers. And how about all non-Dutch customers? That’s just the complement! Next time I’d like to continue with algebra and algebra of sets in specific. Does that sound like it will give you nightmares? Don’t worry, I’ll be gentle!